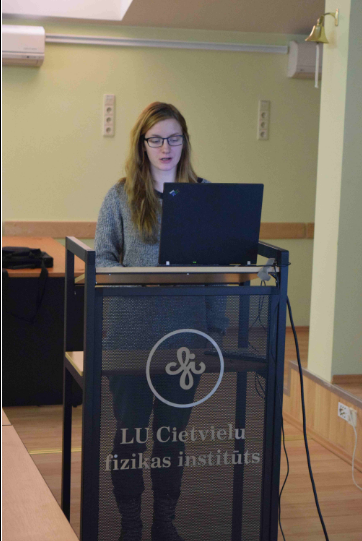 Congratulations to Virgīnija Vītola for successfully defending her thesis and getting a PhD! Years of hard work have finally paid off and we are happy to congratulate Virgīnija Vītola with successfully defending her thesis and getting a PhD! Persistent luminescent material SrAl2O4: Eu2+, Dy3+ is widely used and studied for energy efficient applications. A study of SrAl2O4:Eu,Dy; SrAl2O4:Dy, and undoped SrAl2O4 material was conducted. 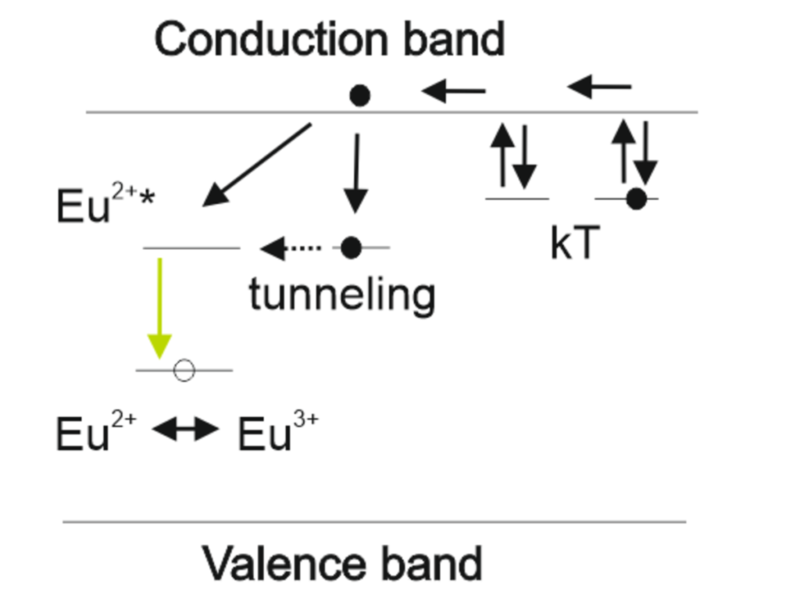 Improvements for the mechanism of persistent luminescence have been suggested, that involve tunnelling of electron from trapping center to Eu3+, and the proof for stable Dy4+ existence in strontium aluminate has been presented. Undoped material luminescence has been observed, consisting of trace impurity and intrinsic defects luminescence.The results of this work give new knowledge and improve the existing concepts of persistent luminescence in Eu activated strontium aluminates. They also open some possibilities for wider applications of persistent phosphors. 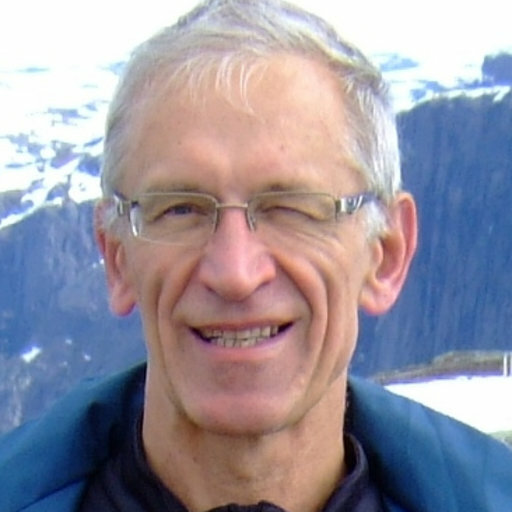 The Grand Medal has been awarded to Linards Skuja by Latvian Academy of Sciences for achievements in optical glass physics and photonics. 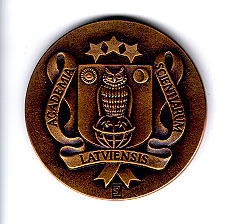 The LAS highest award – the Grand Medal – is awarded for excellence in science. Our work “A new energy efficient method for acquiring long lasting phosphorescent coatings on metals” which we have carried out as a part of the ERDF project Nr. 1.1.1.1/16/A/182 “Phosphorescent coatings prepared by plasma electrolytic oxidation” has been announced as one of the most important scientific achievements in Latvia in 2018 by the Latvian Academy of Sciences. We are proud to announce that a new publication “Novel method of phosphorescent strontium aluminate coating preparation on aluminum” has been written and published in Materials & Design in October. This publication was funded by the ERDF project “Phosphorescent coatings prepared by plasma electrolytic oxidation” No: Nr.1.1.1.1/16/A/182. 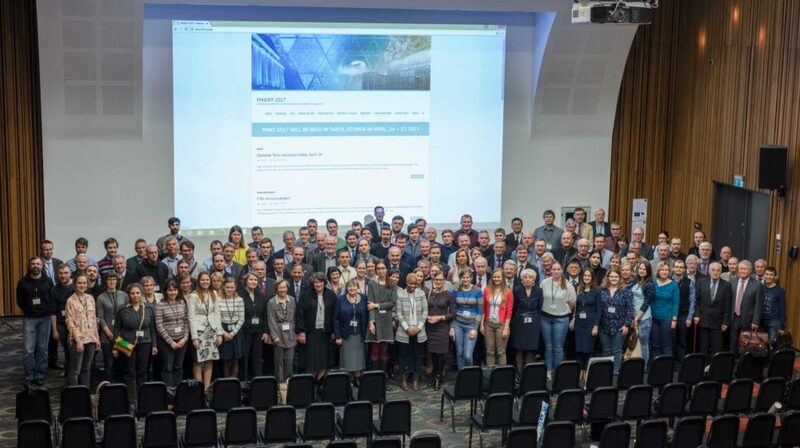 The conference Functional Materials & Nanotechnologies took place in Riga on the 2.-5. October in which most of our staff took participation. A total of seven posters from our laboratory were presented. 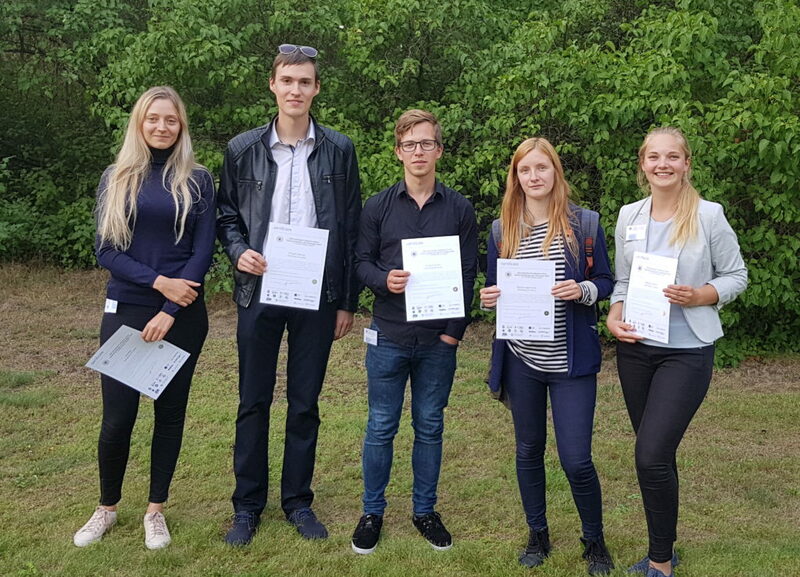 In August we participated in the student oriented conference AMT (Advanced Materials and Technologies) in Palanga, Lithuania, presenting multiple posters and attending the lectures. 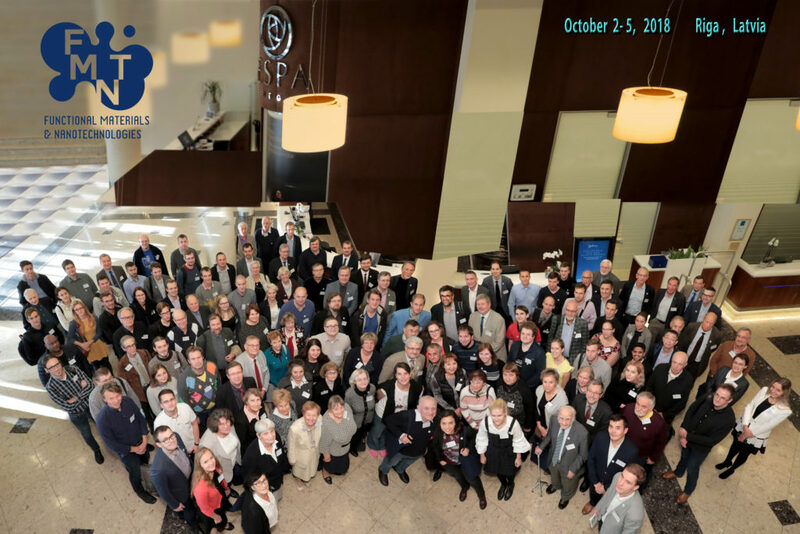 Just last week we also participated in the LumDeTr (Luminescent Detectors and Transformers of Ionizing Radiation) conference in Prague, Czech Republic. 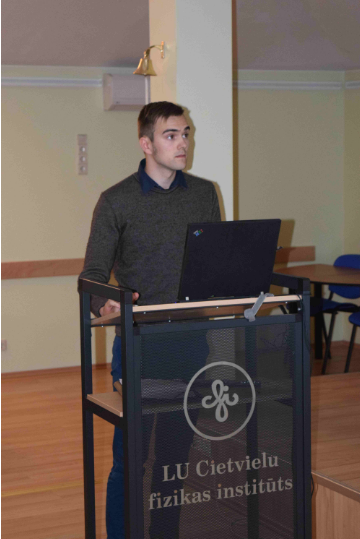 We would like to acknowledge the Mobility Financial Support received from the Faculty of Physics, Mathematics and Optometry, University of Latvia, which partially funded the attendance of this conference. A new publication in the frame of ERDF Project Nr.1.1.1.1/16/A/182 on fundamental processes in phosphorescent materials has been published. SrAl2O4:Eu,Dy is a very eﬃcient long afterglow phosphor with wide range of possible applications. The luminescence properties and the possible luminescence mechanism of this material have been studied extensively, but there is almost no information available about the undoped material. Therefore, this article deals with the luminescence and thermally stimulated luminescence of an undoped SrAl2O4, revealing the possible defects that might be involved in the creation of the long afterglow in doped material. We conclude that undoped material exhibits some luminescence under X-ray irradiation in low temperature; close to room temperatures luminescence is almost fully thermally quenched in comparison to low temperatures. We can observe F and F2 center luminescence as wellas trace metal luminescence inthe emission spectrum.TSL glow curveyields the peaksthat are close to those observed in material with Eu and Dy doping; therefore these peaks are clearly related to intrinsic defects. The peak at around 400K, that is shifting with rare earth doping, might be due to dopant interaction with intrinsic defects. A significant improvement on the control of various electrical parameters was achieved in the last couple of months due to the planned upgrades of the power supply unit. New limits of coating preparation can be achieved now with higher voltages (up to 1000V) as well as with vastly improved software and automated control algorithms allowing uninterrupted change of any desired parameter in time. This modification allows the in-depth studies of effects of high voltage on coating formation process and implementation of RE ions in it. In addition, the stability of the power supply was improved allowing extra-long processing time on high loads. This is important for the different oxide phase formation as recrystallisation occurs only at longer processing times. With the new setup a new set of samples was prepared and further optimization of parameters is undergoing. The main aim is to improve PEO coating to match and exceed the performance of similar materials in other forms. Teksta latviskotā versija ir atrodama šeit. 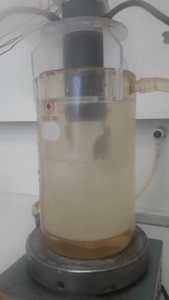 We are happy to announce that significant progress has been recently accomplished and four different methods for preparation of phosphors based on phosphate and vanadate host were developed and optimized: high temperature solid-state, co-precipitation, reverse micelle and colloidal route. pplication for enhancement of 1.3 μm photoluminescence. The work investigating luminescent lanthanum nanoparticles was presented at international conference ‘’Spectral shaping for biomedical and energy applications’’, SHIFT 2017, 13-17 November, Tenerife, Spain. 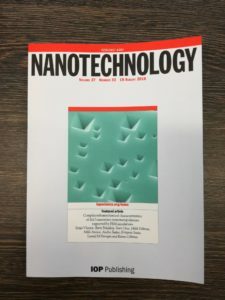 The article, with detailed study of nanoparticle’s size effect on structural and optical properties of doped lanthanum and europium phosphate has been accepted for publication, which can be found online. https://doi.org/10.1016/j.jlumin.2017.12.002 Also, very proud to report that a joint manuscript between our team and researchers from Italy, Vietnam, Poland and Serbia studying phosphors based on vanadate host has been submitted and accepted for publication. We will continue our work, hopefully acquiring materials with improved performances, and attractive practical applications. Successful meeting with colleagues from Germany and Russia. Discussing the last stages of ERANET RUS project ending this year. A certain project milestone has been recently achieved and luminescent coatings with sufficient luminescence intensity to be seen by the naked eye have been acquired. We will continue our work on intensity and luminescence afterglow parameter improvement and it certainly looks like we’re moving in the right direction although of course there’s tons of work still ahead of us. A publication studying optical properties of strontium aluminate has been submitted and is being reviewed. We’re also happy to announce that starting September Boriss Poļakovs and Krišjānis Auziņš have joined the project and are actively working to contribute to project’s successful ongoing. Improvements on PEO reactor chamber (see photo) have been made to insure better repeatability and constant results, allowing to study the coatings with greater detail and less errors. Technical improvements have also been made to aluminum samples – it is now possible to split the samples into smaller pieces with absolutely no potential damage to the coating. Teksta latviskotā versija pieejama šeit. Our team is visiting PROMES CNRS facilities (Font-Romeu, France). We are grateful for the access to the facilities in frame of SFERA 2 project. This great opportunity will be used to prepare samples for the successful realization of ERDF Project Nr.1.1.1.1/16/A/182. Congratulations to MSc. Eng. Katrina Laganovska! Our PhD. Phys. 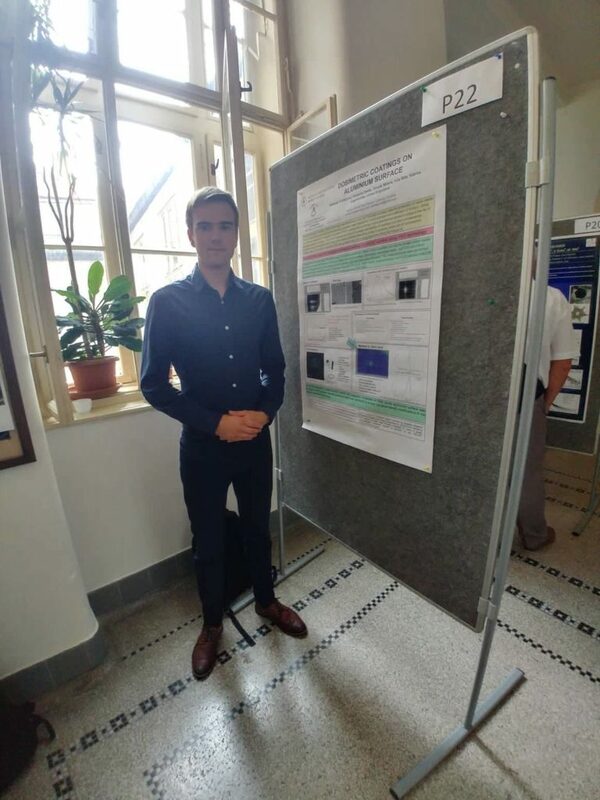 student Aleksejs Zolotarjovs successfully attended RAD2017 conference on radiation and applications in various fields of research. Congratulations to BSc. Phys. Dags Olsteins! New equipment is installed in renovated section of our laboratory, we start to move experiments to the new space. 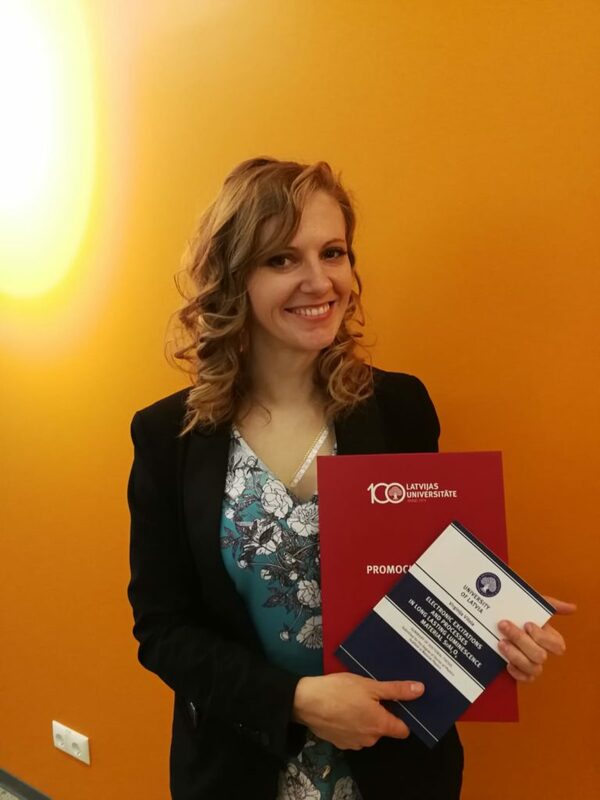 We congratulate Dr.Tamara V. Gavrilovic with the successful evaluation of Post-Doc position in our lab! International conference ‘Functional materials and Nanotechnologies-2017’. Dr. phys. 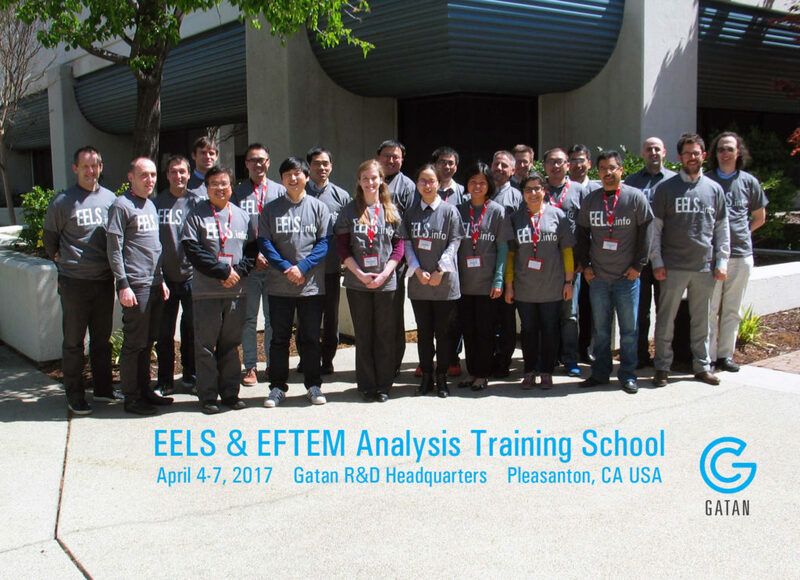 Krisjanis Smits successfully visited the 2017 EELS & EFTEM Analysis Training School in Pleasanton, CA, United States. Thanks to Gatan, Inc. for great reception of the participants! Training School on Upconverting nanoparticles in bioaffinity assays. 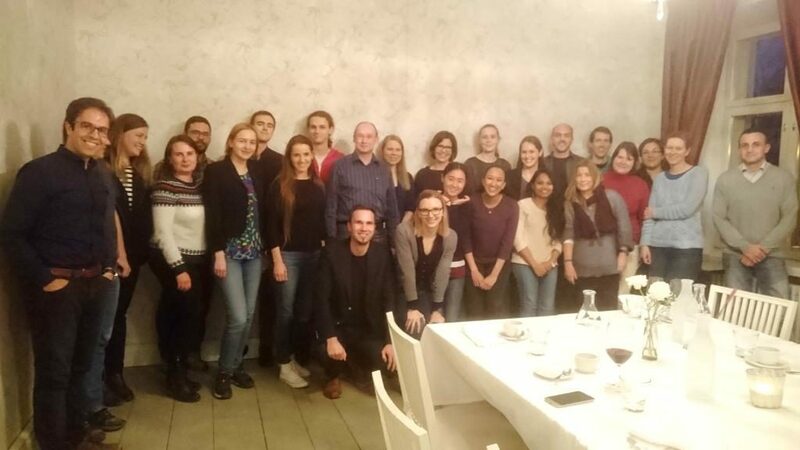 Our PhD student, Aleksejs Zolotarjovs successfully visited Turku, Finland to participate in training school “Upconverting nanoparticles in bioaffinity assays – from bioconjugation to luminescence readout” organized by COST action CM1403. We are looking forward to continue research collaboration with the facility and prepare samples for further study. 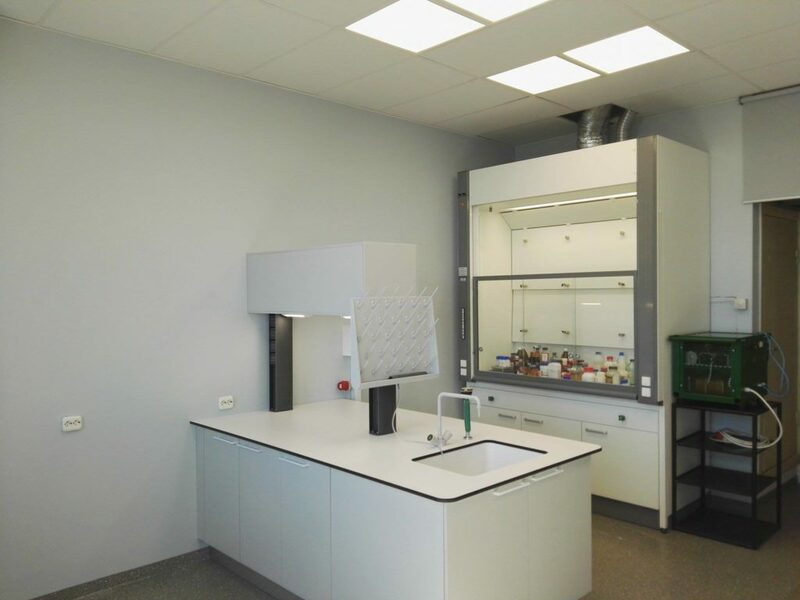 One of our laboratory rooms was renovated and finished yesterday. New equipment including chemical fume hood and appliances is on it’s way. Project -Phosphorescent coatings prepared by plasma electrolytic oxidation- has been launched! We are happy to announce that a new project “Phosphorescent coatings prepared by plasma electrolytic oxidation”, Nr.1.1.1.1/16/A/182, has been launched. The proposed project foresees studies of luminescent coatings prepared by plasma electrolytic oxidation (PEO). Up to now, PEO coatings were mostly studied because of their tribological properties; however, PEO coatings also have good wear resistance, high hardness and are chemically stable therefore this technology can be applied to form protective coatings on metals. It is known that many oxide based materials exhibit good luminescent properties; however, the luminescence of PEO produced oxide layers was not studied before. 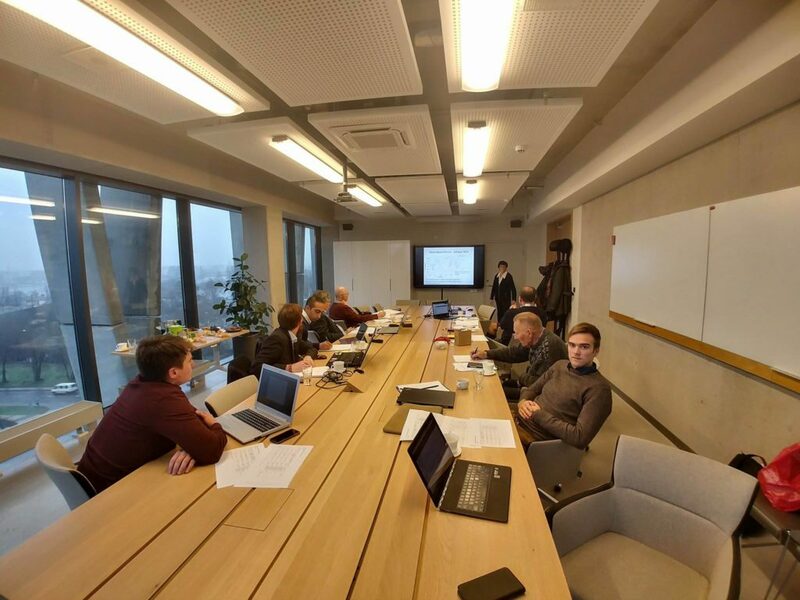 The first research in this direction was made by private company Elgoo tech in cooperation with Insitute of Solid State Physics University of Latvia. 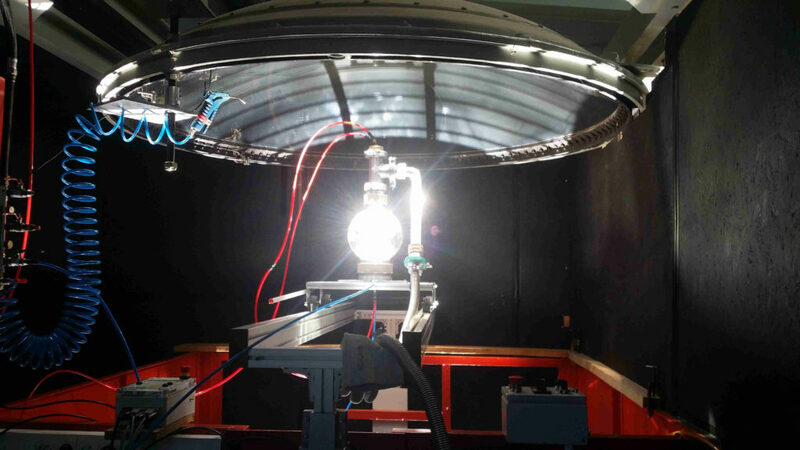 During the research project, PEO process will be used to produce luminous aluminium coatings. 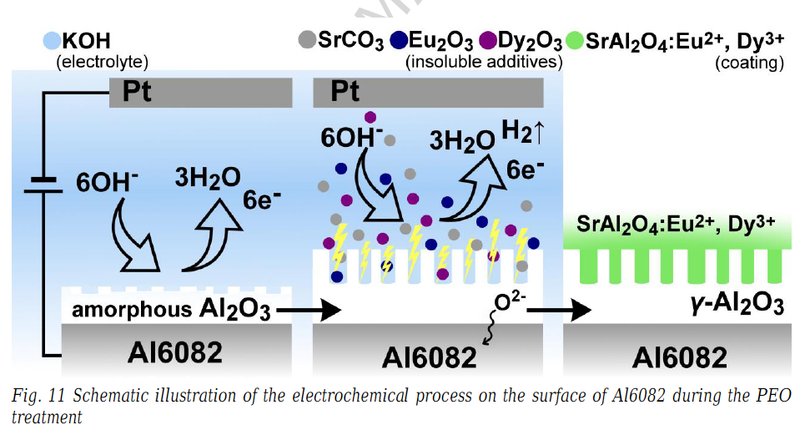 The analysis of accessible data indicates that PEO synthesis is a promising approach for production of materials with long lasting luminescence, for example SrAl2O4:Eu:Dy. The coatings prepared by PEO will be transparent in blue and UV range, therefore the final long lasting luminescence efficiency is expected to be several times higher than that of luminescent paints currently in use. In addition, coatings could serve as protection for metals since the durability of such coatings is expected to be better compared to paints. See information in Latvian here! See official institute webpage about the project here! Pēdējo pāris mēnešu laikā panākts ievērojams uzlabojums procesa elektrisko parametru kontrolē,ko nodrošināja barošanas bloka veiktā modernizācija. PEO iekārtai ir vairāki uzlabojumi ieskaitot augstāku spriegumu limitu (līdz 1000 V), kā arī ar ievērojami vieglāk lietojamu programmatūru un automatizētiem vadības algoritmiem, kas ļauj nepārtraukti mainīt jebkuru vēlamo parametru procesa laikā. Šīs iespējas ļauj padziļināti izpētīt augsta sprieguma ietekmi uz pārklājuma veidošanas procesu un RE jonu ieviešanu tajā. Turklāt tika uzlabota barošanas avota stabilitāte, nodrošinot ilgāku nepārtrauktu apstrādes laiku pie lielām slodzēm. Tas ir svarīgi dažādiem oksīda fāzes veidošanās procesiem, jo pārkristalizācija notiek tikai ilgākos apstrādes laikos. Tika sagatavots paraugu komplekts un turpināta parametru optimizācija. Galvenais mērķis ir nemainīgs: uzlabot ilgspīdošu PEO pārklājumu ar kvalitāti, kas sakrīt vai pārsniedz līdzīgu materiālu kvalitāti. ERAF projekts -Fosforiscējoša pārklājuma iegūšana plazmas elektrolītiskajā oksidācijas procesā-. Projekta mērķis ir ne-saimnieciskajā rūpnieciskajā pētījumā iegūt alumīniju saturošu fosforiscējošu pārklājumu plazmas elektrolītiskās oksidācijas (PEO) procesā. Projekta gaitā paredzēts PEO procesā iegūt leģētus ar Eu joniem aktivētus kompleksos oksīdus, izveidot aktivatoru nanokristālu pārklājumu poru aizpildīšanai un, veicot gala oksidāciju, PEO procesā iegūt luminiscentu pārklājumu. Paralēli veicamajām darbībām, tām tiks pielāgota SIA “ElGoo tech” īpašumā esošā PEO aparatūra un tās parametri, kā rezultātā iegūsim validētu nepatentētu tehnoloģiju. Tiks veikta iegūto materiālu īpašību (luminiscences, struktūras un morfoloģijas) izpēte. Plānots iepirkums, kura nolikumā, vērtēšanā un tehniskajā specifikācijā tiks piemēroti Zaļā publiskā iepirkuma kritēriji un principi. Ar saimniecisko darbību nesaistīto projektu plānots īstenot kopā ar sadarbības partneri – komersantu SIA “ElGoo tech” no 2017.gada 1.februāra līdz 2019.gada 31.oktobrim, ar kuru kopā ir izstrādāts šis projekts un noslēgts sadarbības līgums. 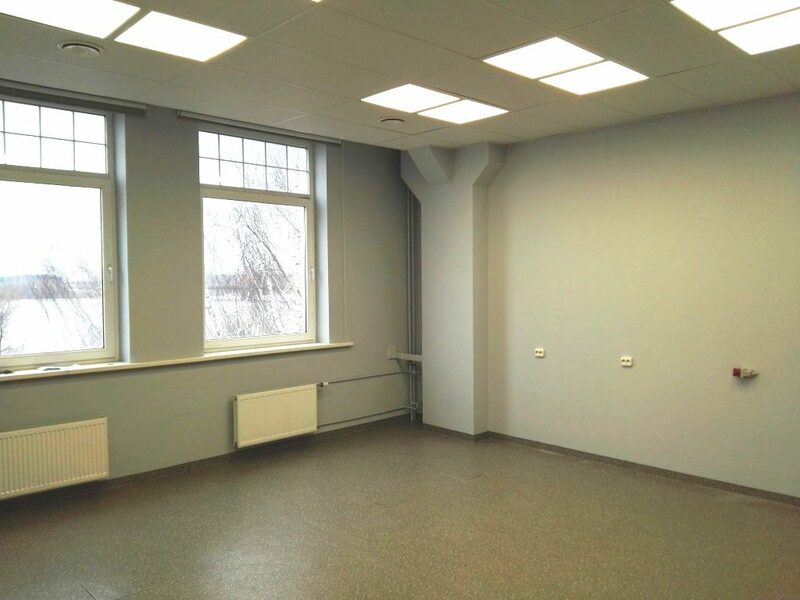 Plānotās projekta izmaksas ir 539 844.50 EUR. Plānots iegūt 120 gab. fosforiscējoša pārklājuma paraugus, vienu šī procesa validētas nepatentētas tehnoloģijas aprakstu, 6 zinātniskos rakstus, piesaistīto privāto finansējumu un 1 komersantu, kurš sadarbojas ar pētniecības organizāciju. Pētījumā tiks nodarbināti vismaz 11 darbinieki, t.sk. 4, kuriem tiks izveidotas jaunas darba vietas. 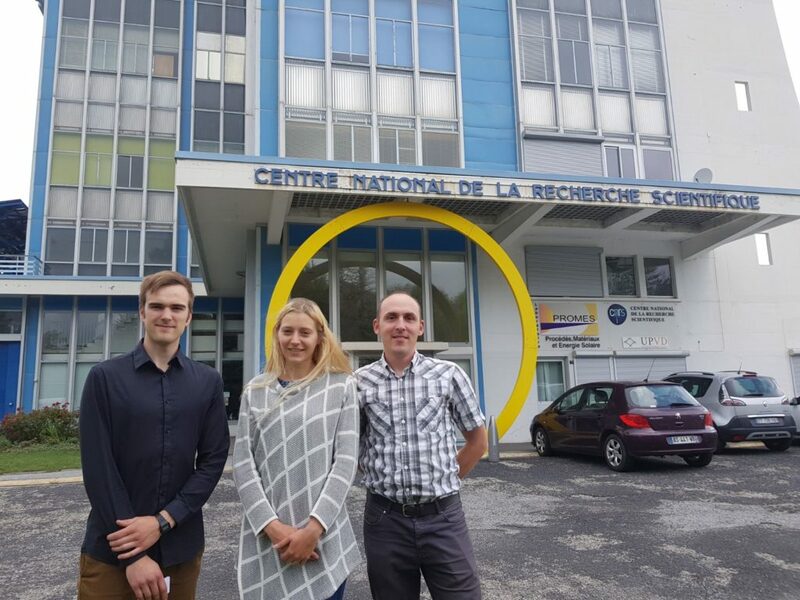 Projektu plānots īstenot inovatīvo materiālu un tehnoloģijas nozarē izmantojot starpdisciplinaritāti – dabas zinātnes (1.3 fizika (Physical sciences) un 1.4 ķīmija (Chemical sciences)) un inženierzinātnes un tehnoloģija (2.5 materiālu zinātne (Materials engineering) un 2.10 nanotehnoliģijas (Nano-technology)). Tiks pētīta iespēja izveidot luminiscentus pārklājumus, izmantojot plazmas elektroķīmisko oksidāciju (PEO). Patreiz PEO procesā iegūtie pārklājumi tiek aktīvi izmantoti, jo tiem piemīt labas aizsargājošās (liela cietība, laba nodilumizturība, termiskā aizsardzība, pretkorozijas uc.) īpašības. Metālu un dažu tā sakausējumu oksīdiem, ir labas optiskās īpašības, taču, piemēram, luminiscence PEO procesā iegūtiem pārklājumiem iepriekš nav pētīta. Pirmie pētījumi tika veikti SIA “ElGoo tech” sadarbojoties ar LU CFI, kuros iegūti pirmie labi luminiscējošie pārklājumi. Šie rezultāti un literatūrā atrodamie cita veida pētījumi parāda, ka ar PEO metodi iespējams izveidot arī fosforiscentos pārklājums, kuriem būtu ievērojams pielietojumu potenciāls, piemēram, SrAl2O4:Eu:Dy, kuram piemīt vienas no lielākajām kvantu efektivitātēm un ilgākā pēcspīdēšana. Tādēļ šī pētījumu projekta ietvaros plānots iegūt alumīniju saturošus pārklājumus ar ilgu pēcspīdēšanu (fosforiscenci). Iegūstamie pārklājumi būs caurspīdīgi tuvajā UV apgabalā, tādejādi gala pārklājumam būs vairākas reizes lielāka efektivitāte salīdzinot ar pārdošanā esošajām fosforiscentajām krāsām. vienlaicīgi fosforiscējošais pārklājums kalpos kā metālu atikorozijas pārklājums un šāda pārklājuma noturība, ilgmūžība būs daudz lielāka salīdzinot ar krāsām. Politiskā ilgtspēja – ir nodrošināta, jo projekta mērķi atbilst RIS3 noteiktajiem tautsaimniecības transformācijas virzieniem un izaugsmes 1., 2. un 3.prioritātei. Projektu raksturojošie atslēgas vārdi – plazmas elektroķīmiskā oksidācija, pārklājumi, fosforiscence, luminiscence, oksīdi, nanokristāli. Oficiālā www.CFI.lv lapa par projektu ir atrodama šeit. Great work! Krisjanis Smits took his part in this unique research. Starting the year with strontium aluminates! Great work by the members of the laboratory! Take a look! A great review of the may-2016 conference that took place in Wroclaw, Poland! Check out the view from Dayong Jin published in Nature Photonics here. Krisjanis Smits and Aleksejs Zolotarjovs had a really productive and interesting visit. 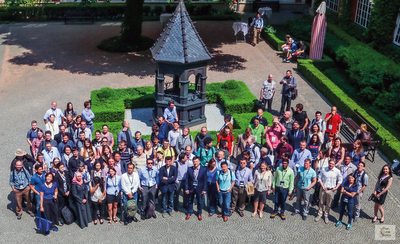 We hope to meet again soon with all the participants of the conference. PhD.phys. 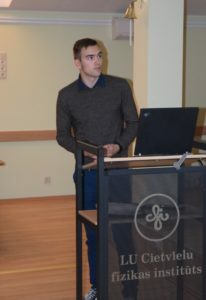 student Aleksejs Zolotarjovs and M.Sc. 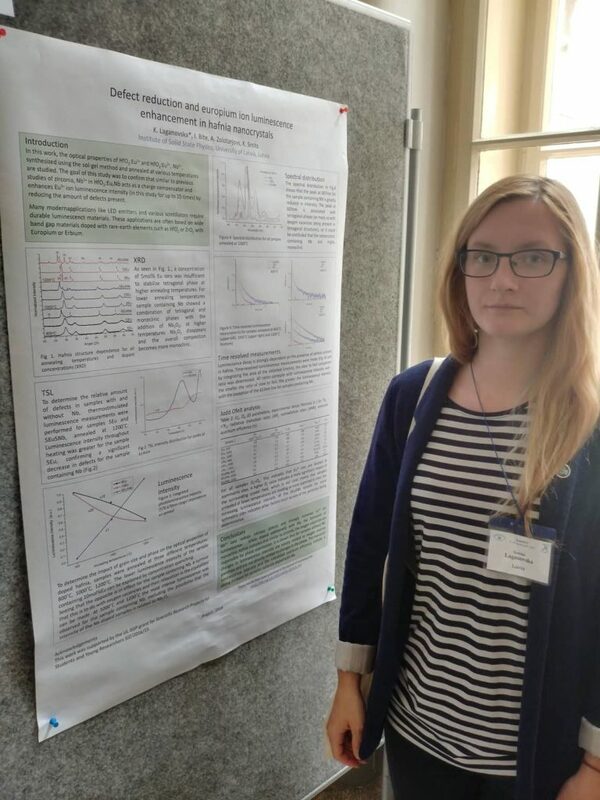 student Katrīna Laganovska both received the grant for Students and Young scientists. 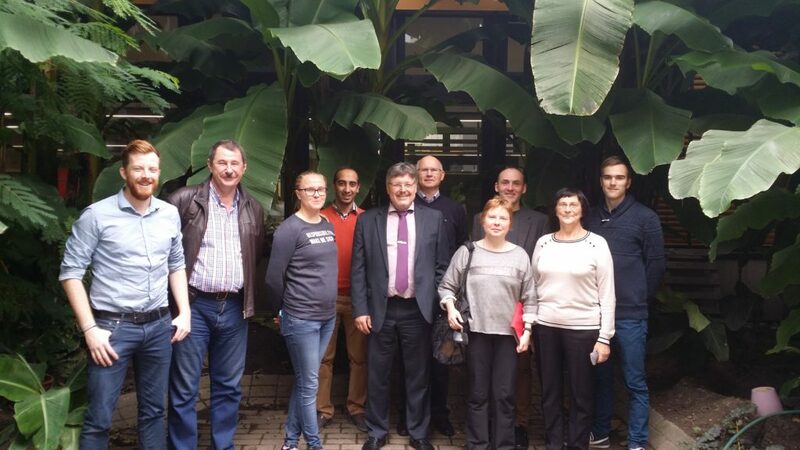 Successful discussion concerning further steps in our international ERANET RUS PLUS, NanoRadDos project! Thanks to our colleagues in Cologne for great organisation of the event! Our article was advertised on the front cover of Nanotechnology journal. Pleasant surprise! Sergei Vlassov! It was interesting to participate in this research.